Queen and worker policing in the monogynous and monandrous ant, Diacamma sp. 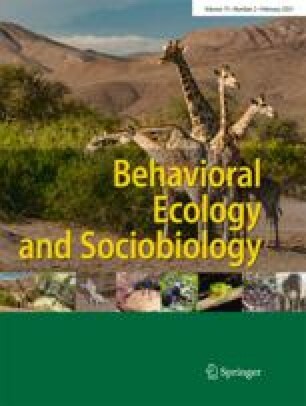 Policing behavior that prevents workers from laying male eggs was examined in the monogynous and monandrous ponerine ant Diacamma sp. from Japan, in which a singly mated worker called a “gamergate” reproduces as the functional queen in each colony. Since oviposition by virgin workers is rare in the presence of a gamergate, we separated a portion of workers from the gamergates and induced their oviposition experimentally. When orphaned workers had started to oviposit, they were returned to the original colonies, where they continued to lay eggs for a while. The gamergates and other workers interfered with the laying workers by aggressively taking and finally eating the eggs. In total, 60% and 29% of the worker-derived eggs were eaten by gamergates and non-mother workers, respectively. The observed worker-worker interactions were not driven simply by competition to leave own sons, because non-laying non-orphaned workers interfered with worker reproduction. Furthermore, orphaned workers were usually attacked by non-orphaned workers soon after colony reunification. These results indicate that both queen policing by gamergates and worker policing in this species are mechanisms inhibiting worker oviposition. The gamergate contribution to policing was proportionately larger than that of workers, but among virgin workers, the relationship between dominance rank and contribution to policing was not clear. But about 11% of the eggs were not policed and were added to egg piles, especially in large colonies. Worker policing in a monandrous and monogynous eusocial Hymenoptera contrasts to other recent findings, and possible genetic, social, and ecological factors for its evolution in Diacamma sp. are discussed.